Watching a group of people square dancing at a wedding in Nunavut was part of the inspiration behind a book about a historic Arctic expedition, and an upcoming presentation in the University Lecture Series at UFV. Dr. Heather Davis-Fisch will be discussing the power of performance in bridging cultural differences, among other topics during her lecture, which is entitled Competing Performances, Competing Histories: Survival Cannibalism and the Franklin Expedition. The talk will centre on her book about the Franklin expedition — ­­an 1845 British voyage led by John Franklin that had a goal of completing a Northwest Passage, during which the ships went missing and were never found. Although the details of what happened aren’t completely known, the tale of how the crew met their demise has long been told through theatrical performance and literature. “Those plays would allow for closure to happen in the theatre, because it couldn’t happen in real life,” said Davis-Fisch, who is a UFV faculty member in English and theatre. Their stories were also preserved through Inuit oral history, as the Inuit people made contact with the men from the Franklin expedition. Davis-Fisch’s lecture will trace how allegations that survival cannibalism occurred among the expedition’s final survivors were vehemently denied by English author Charles Dickens in a series of rhetorically compelling editorials, and simultaneously preserved in Inuit oral histories of finding human remains at macabre campsites, and then overwritten by Dickens’s electrifying performance in Wilkie Collins’s 1857 play The Frozen Deep. These three examples testify to the remarkable power of performance to preserve cultural memory, Davis-Fisch asserts, but also reveal that this power can be dangerous: today Dickens’s performances serve as an ethical injunction against the misuse of performance as a tool of historical revision.Davis-Fisch’s book, Loss and Cultural Remains In Performance: The Ghosts of the Franklin Expedition, started as a PhD dissertation in 2007 at the University of Guelph in Ontario. When she started the project, it wasn’t going to be about Franklin. It was going to be about cross-cultural performances, and how performance was used to break down barriers of language. It got her thinking about the role performance played in the early stages of contact in the Arctic— like how and why Inuit started square dancing. She then began tracing back contact between Western and Inuit culture, which led her to the Franklin expedition. 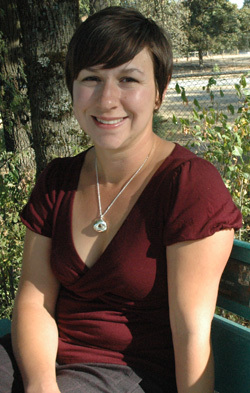 After defending her PhD in 2009, she started her postdoctoral research at UBC, where she focused on turning her dissertation into a manuscript. She travelled to London to conduct further research, where she saw many of the items she had been reading and writing about. In 2011, Davis-Fisch finished her book, which was published by Palgrave MacMillan. The book is timely, as Parks Canada recently finished another search for the ships, which was unsuccessful. Davis-Fisch believes it’s also relevant as there are still many questions about how Britain and Canada first interacted with the Inuit, Dene, and northern Cree. “It’s one of the starting points of where we are now,” she said. She also believes her lecture will be helpful for her students, as it’s showcasing what research can look like in the world of theatre and English.